We know we need to eat more of them, but really, how many of us get enough? An why is it so hard to eat more of them? Well this week, I give you this recipe that will have you clamoring for more… cauliflower. 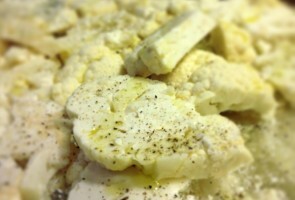 Cauliflower is, like many vegetables, misunderstood and usually mis-cooked. I just made that up: mis-cooked. Much like “misfiled” means you filed it, but in the wrong place, mis-cooked means you cooked it, but in the wrong place. People like to cook cauliflower in the wrong place. 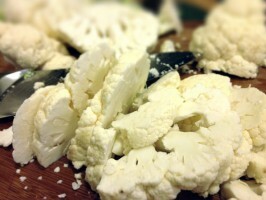 Steamers, microwaves, pots of boiling water (ick) are the usual instruments of the mis-cooking of cauliflower. 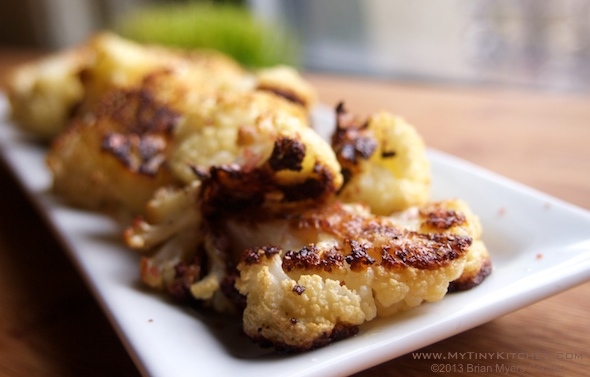 The proper place to bring out the magical goodness of cauliflower is the oven. I LOVE doing the photography for the site, and as I make some of my older recipes from the past year, I’m taking the opportunity to update the photo. I’ve settled for now on using natural, indirect afternoon light from the window in my living room. I displace our new cat from her perch on the back of the easy chair in the window, set a large bamboo cutting board in her place and have at it. When the weather is nice, I’ll even open the window and venture out on the window ledge an fire escape. I use an Olympus PEN Mini (E-PM1) mirrorless Micro Four Thirds interchangeable lens camera. Smaller than a DSLR but far more capable than any point & shoot, this little gem has a far larger sensor, 17mmx13mm vs 6mmx4.5mm, than any p&s cameras. It gives me the option of point & shoot ease OR the fine tuned manual control by combining the best of both worlds into a sleek compact (if not exactly pocket-sized) package. In case you can’t tell, my favorite method of preparing vegetables is roasting (see my Roasted Dynamic Duo). The high heat brings out the caramel-y sweetness in even the most misunderstood of vegetables, rendering them irresistible you young and old alike. And this is never more true than it is with cauliflower. It actually becomes SO caramel-y good, it’s like vegetable crack. In fact, I’m snacking on some RIGHT NOW. That’s right, I’m blogging on vegetable crack–call the WordPress police! Cauliflower Crack, will (I guarantee you) soon replace popcorn as your new ‘Favorite Movie Snack.’ Seriously, Orville and I have unapologetically put away two whole HEADS in a single evening. And we LOVE popcorn and make it in a MULTITUDE of delicious variations (in fact, I have a whole popcorn series coming up soon). But when the cauliflower is on sale, we load up on this amazing snack food and chow down! In fact, I had friends take this to super macho Super Bowl parties. they were met with jeers when they set out their bowl of Cauliflower Crack, only to be confronted by sheepish football fans not ten minutes later with an empty bowl asking for more! Yeah, it’s that good. It’s so good, you won’t even want to bother making just one head at a time, because roasting two is just as easy, and your family will down two heads of cauliflower and then ask for MORE! Gotta love that. Toss this all together and spread it out. Line baking sheets with foil for easy cleanup–you’ll need one half-sheet pan for each head of cauliflower. Pile one head on each pan, drizzle with 2-3 tbsp olive oil, toss to coat. Spread the slices into a single layer, and season liberally with Kosher salt and black pepper. When it looks like this – it’s ready! 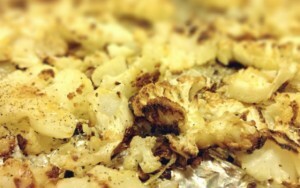 Reserve 1 ½ cup of chopped roasted cauliflower for the base of my Naughty & Nice Macaroni & Cheese! Taste a piece, give it a final sprinkle of salt and pepper if needed and platter it up. Put it on the coffee table, start your movie night and watch in amazement as your family devours two heads of cauliflower (!) before the end. Notice how it gets even sweeter as it cools to room temperature–how does it DO that? It’s like magic. Really. Guaranteed. I really like this recipe! I add raison’s to my batch and back for an extra sweet touch! Again tonight…love this…Happy New Year finger food treat. HaPpY NeW YeAr! This is seriously amazing…I didn’t think I could eat cauliflower without a cheese sauce…this is crack! I’m eating it now! LOVE that touch – I\’ll give it a go next time I whip this up! Found a home in a hot Scio, Ohio oven on this cold Yummmmmm!!! So happy you like it – roasting cauliflower was a real game changer for me in terms of going from just liking this misunderstood crucifer to loving it! Thanks to you, I ate a WHOLE head of cauliflower for dinner the other nite. I made one addition, I had some white cheddar cheese powder, (usually used for popcorn) from Target. I sprinkled some of that on after baking, now THAT was CRACK! I imagine parmesan cheese would be good too. Thanks for the recipe, it was fun to make and fun to eat! And even more fun to take the ball and run! Love that you made this your own. I sometimes like to toss it with a little curry powder, salt and pepper, then roast. The possibilities are endless! Crack is in the oven!! Thanks!!!! Thanks! What a great idea you have…sharing creative ideas about the thing we (almost) love best – FOOD! Thanks – I've got lots more to share in the coming months! I'm going to bring this to the superbowl party we are attending on Sunday! GREAT RECIPE!! They are in the oven as I type. Hubby doesn't like the smell… and you didn't mention the cottage cheese looking explosion left on the counter after cutting 🙂 still can't wait for the result!